July 27, 2014: Scientists using mission data from NASA’s Cassini spacecraft have identified 101 distinct geysers erupting on Saturn’s icy moon Enceladus. Their analysis suggests it is possible for liquid water to reach from the moon’s underground sea all the way to its surface. 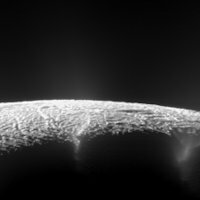 Over a period of almost seven years, Cassini’s cameras surveyed the south polar terrain of the small moon, a unique geological basin renowned for its four prominent "tiger stripe” fractures and the geysers of tiny icy particles and water vapor first sighted there nearly 10 years ago. The result of the survey is a map of 101 geysers, each erupting from one of the tiger stripe fractures, and the discovery that individual geysers are coincident with small hot spots. 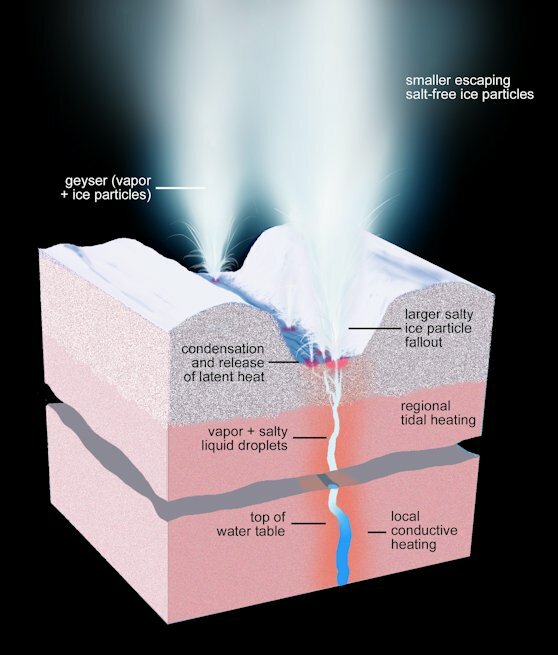 These relationships pointed the way to the geysers’ origin. The Cassini-Huygens mission is a cooperative project of NASA, the European Space Agency and the Italian Space Agency. The Jet Propulsion Laboratory (JPL) in Pasadena, California, manages the mission for NASA's Science Mission Directorate in Washington. The Cassini orbiter and its two onboard cameras were designed, developed and assembled at JPL. The imaging team consists of scientists from the United States, England, France and Germany. The imaging team is based at the Space Science Institute.